The last time Singapore was wowed by Ran Hwang's artwork, it was in a dedicated culture section of an Hermès boutique in 2014. Pins and Plexiglas were assembled to form 'Becoming again', an intricate structure that told its story through motifs of cherry blossoms, peony flowers and spider webs. Crafted by the 57-year-old South Korea-born artist based in Seoul and Manhattan, the world of wonders represented a past that connected with the present, with the subjects in a state of becoming or developing again. 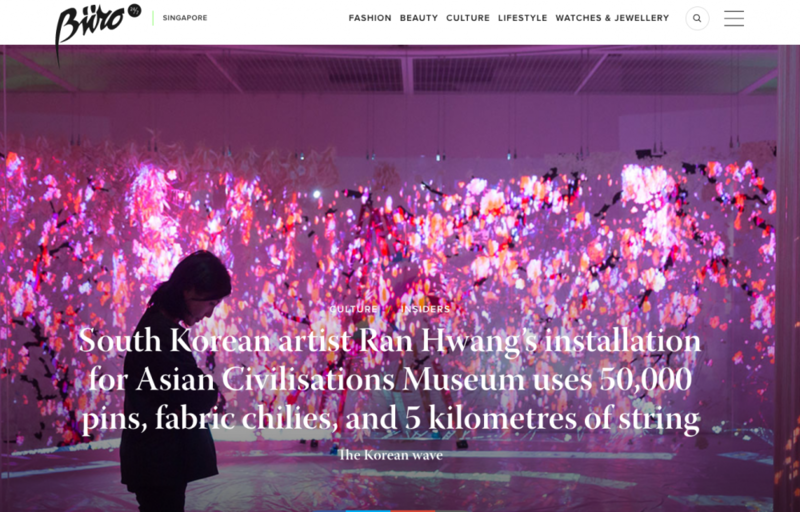 And like any good work of art, 'Becoming again' is a timeless creature, resurrected this year in the Asian Civilisations Museum's (ACM) largest exhibition to date, 'Joseon Korea: Court Treasures and City Life'. The Asian Civilisations Museum has commissioned Ran Hwang to end the exhibition on a sweet note. Scouted by the museum's senior assistant director of audience Bernard Tan, the artist has built on her previous artwork to present another meditative experience: 'Becoming Again; Coming Together', a mixed-media installation that occupies the entire Learning Gallery at ACM. Constructed to complement the blockbuster exhibition, Ran Hwang has added four additional elements: Hanging threads of 50,000 pieces of chili, a projection of a Korean bride and groom, a pair of phoenixes constructed out of five kilometres of string as well as music exclusively composed by Jung Seung Kim, a director of the National Theater of Korea. To understand Ran Hwang's work, one must understand the Joseon dynasty and its cultural impact. After the fall of Korea's Goryeo dynasty, the Joseon dynasty was established in 1392 and lasted for 500 years till 1897. As the last dynasty before its Japanese occupation, remnants of its influence still remain in contemporary Korea today. Walking through more than the 150 artefacts and treasures from the National Museum of Korea and the National Palace Museum of Korea in the exhibition, you'll notice objects that won't look out of place today: The six-fold screen of 'The Sun, Moon and Five Peaks', a painting seen on the 10,000 South Korean banknote; the traditional hanbok and clothes which bear dragon motifs — a mythical symbol associated with power. Like the dragon, animals both mythical and real offer great symbolism in Joseon dynasty. Fish equal fertility, peonies were emblems of virtue and honour, tigers served as protective symbols while pheasants represented virtues a queen should have: Benevolence and integrity. As for the phoenix, Ran Hwang has adapted the mythical creature to represent eternal love. Buttons, pins and thread represent something more to Ran Hwang other than everyday household objects. While working in an embroidery company in New York in the early 2000s, the fine arts graduate stumbled upon abandoned buttons, which signified her struggles living as an artist at the time. Seeing pins as the points for connection and threads as lines of communication, her meditative, repetitive and almost ritualistic nature of her work aligns with Zen Buddhism. This style is seen in commissioned pieces such as Dior's 'Lady Dior As Seen By' exhibition in 2016, which saw Ran Hwang reimagining the leather Lady Dior bag into a transparent sculpture decorated by buttons, beads and pins that formed red plum blossoms. In 'Becoming Again; Coming Together', Ran Hwang projected on the wall an image of a pair of phoenixes in courtship, before tracing the outline and filling it with pins and thread. Visitors can walk through what was the curved Plexiglas structure 'Becoming again', now accentuated with hanging bunches of white-coloured chili. Caught in between the mythical creatures and the standing structure are images of a bride and groom dressed in royal garb, projected on a curtain of hanging threads in front of two pillars. Traditional Korean music pierces through the silent relationship between past and present as another projection of flying phoenixes dart across the structure. Ran Hwang's art serves a purpose far greater and richer than to fulfill the four walls of your Instagram photo frame. Among the many stories from the Joseon dynasty, the artist has picked the moment that appears only once in a person's life of that period: A wedding. With the projections of commoners in luxurious, traditional costumes — also a once-in-a-lifetime opportunity - at their wedding as well as the flying phoenixes, the artist quips that the wedding scene is "very transient, but they wish for eternal life — a kind of contradiction." Ran Hwang's own traditional upbringing is interwoven into the contemporary structure, notably in her choice of colours. While her family observed the neo-Confucianism values of respecting elders, she also grew up Buddhist ("I've been going to the temple since I was five"). The commoners of the Joseon dynasty — who still clung onto Buddhism and Shamanism — shared Ran Hwang's belief of red symbolising protection from evil spirits. Hints of this hue are interspersed among the chillies, which were given a wash of white as a contemporary backdrop for the colourful projections. In the past, chilies were hung in front of houses that bore a new baby boy, covetable at the time. "If a woman cannot bear a boy, the husband can ask for a divorce," shares Ran Hwang on the customs of the period. "It's one of the seven sins — not having a son as an heir." Assembling 'Becoming Again; Coming Together' took eight days, a process that proved trying for Ran Hwang. But according to the artist, the challenging parts of the exhibit's assembly were forgotten upon its completion. Now serving as a dialogue between old and new, it also mirrors the artist's tastes in her own consumption of Korean pop culture: While she favours the sounds of traditional Korean string instruments such as gayageum and geomungo, she also binge-watches Saimdang, Light's Diary, a drama that premiered earlier this year. Its subject matter? Shin Saimdang, an artist and calligrapher from the Joseon dynasty. 'Joseon Korea: Court Treasures and City Life' will run from now to 23 July, 10am to 7pm (9pm on Friday) at the Asian Civilisations Museum.